Can you imagine life without some of your favorite birds? If the summer breeding ground for over 300 of North America's bird species is not protected, we could lose some of these amazing birds forever. The Boreal Forest, known as North America's Bird Nursery, is one of the largest unspoiled ecosystems left on Earth - and it is under threat! Please tell Canadian officials to protect the pristine Boreal Forest before it is irreversibly damaged. Several pipeline projects are planned for the Canadian Boreal region - and they are just the first step in opening up this unspoiled area to unsustainable mining, clear-cutting, and runaway development. But it doesn't stop there. These pipelines will fuel the Alberta Tar Sands, the dirtiest oil extraction process on Earth, which produces 3 times as much greenhouse gas as conventional oil production - polluting air, land, and water. This is bad for wildlife and our environment. 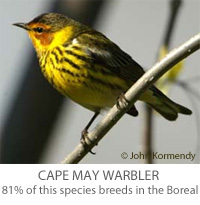 The Boreal is the breeding ground for sparrows, warblers, woodpeckers, the endangered Whooping Crane, and many others. Unless it is protected, runaway energy development will destroy habitat for millions of migratory birds forever. The only way we can conserve the Boreal is to protect critical habitat before any pipelines are built - and place a moratorium on Tar Sands expansion. Canadian officials have proposals in front of them to protect the Boreal. Send a letter today urging them to take action before any pipeline is built. Help save our feathered friends and our planet! Thank you for signing up for Health Alerts from Care2 via ThePetitionSite! Your email address has not been bought from other sources. If you learned something interesting in this newsletter, please forward it to your friends, family, and colleagues.